Home > French Blog > French Culture > How To Use a French Bathtub to Shower and Wash Hair? I mean, if you are REALLY petite and thin, you might be able to stand up and direct the flow towards the back wall, but it’s going to be almost impossible not to splash around. So you’re going for solution number one, and decide to sit down in the cold empty French bathtub. Shower yourself keeping the shower very close to your body, directing it slightly towards the back wall. It’s possible, not super comfy, but I’ve done it many times when there was not enough water to run several baths in a row, or when I was in a hurry. or hold the shower head between your knees (since if you just put it down as it is running, even if you are very careful to place it face down, it will turn face up, act like a fountain, and splash everywhere). When you are ready to rinse, bend your head back, and holding the shower with one hand very close to your hair, brush the water off your hair with the other hand. It takes practice, but splashing can be minimal. Just slide down and put your hair in the water (as my daughter Leyla is kindly demonstrating for us in the picture). Sit back up and shampoo. Rinse the shampoo off the same way, dunking in the water. Repeat the operation if you want to shampoo twice, or use conditioner. To rinse your hair very clean, or if your bath water was full of soap or terribly filthy (I don’t know… maybe you’ve been digging in the dirt all afternoon…) use the hand shower as described above. 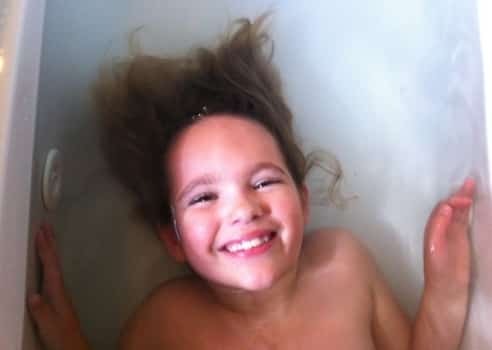 This is how to wash your hair in a French bathtub! 4 – What About Taking a Shower in a French Bathtub With a Shower Curtain? If you do have a shower curtain (un rideau de bain), you are in luck! These are rare in French homes. You can indeed take a standing shower, simply holding the shower with one hand. But at least, there will be warm steam, so you won’t freeze, and transforming the bathroom into a swimming pool will not be an issue. Voilà – I hope these essential tips will make you feel ready to face the French bathtub during your next trip to France. For more serious (or not…) tips about traveling to France, check out my Essential French Dialogues + Tips audiobook – recorded at different speeds and enunciations, this audiobook focuses on today’s modern glided pronunciation and gives you plenty of useful vocabulary and tips to prepare your trip to France. My downloadable French audiobooks are exclusively available on French Today. Finally, learn the daily bathroom routine vocabulary in French with a short video featuring the famous videogame “The Sims”.